The New Cub Cadet Z5 is the ultimate zero-turn mower, delivering maximum efficiency and market-leading performance – the perfect combination for real professionals. The high back seat with arm rests is from the commercial vehicle industry ensuring a comfortable work place and reduces operator fatigue when cutting for long periods of time. Steering wheel control and four-wheel steering provides precision and confidence to tackle terrain other riders can’t handle. 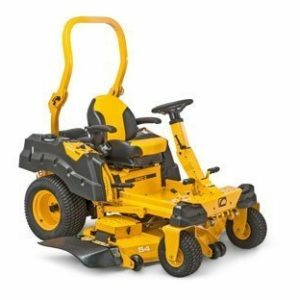 Like all Cub Cadet mowers, the Z5 is built with ultra-tough components featuring a strong and robust welded steel deck, solid and corrosion resistant e-coated frame and smooth powerful drive under all conditions. If you expect nothing but the very best from your mower, you will be impressed with the Z5, the ultimate zero-turn mower, designed for the toughest, most demanding conditions.